"The Russian Famine of 1921-1922 is the worst, both as regards the numbers affected and as regards mortality from starvation and disease, which has occurred in Europe in modern times" - League of Nations report on economic conditions in Russia. The famine of 1921-1922 was a controversal and politicised subject, and both the numbers of dead and causes of the famine were disputed. The estimated number of famine victims, either through starvation or associated diseases, varies from 1 million to 10 million people, though 5 million dead is the figure most frequently quoted. Severe drought and failed harvests, continuous war since 1914 (and the resulting damage to property, displacement of population, destruction of the transport system and killing of animals), forced collectivisation of farms and requisition of grain and seed from peasants (preventing the sowing of crops) by the Soviet authorities, and an economic blockade of the Soviet Union by the Allies were all contributing factors to the severity of the famine. The famine led directly to Lenin's introduction of the New Economic Policy (NEP), which re-introduced elements of capitalism and free trade into the Soviet economy - allowing farmers to sell some of their produce privately, rather than solely to the state. Russia's labours: tinted photographs which show Soviet Russia shortly after the Russian Revolution, and focus in particular on the lives of the general population. They include photographs of peasants in the famine area, the aftermath of war, and the provision of relief from trains, together with a map and graph relating to the famine. 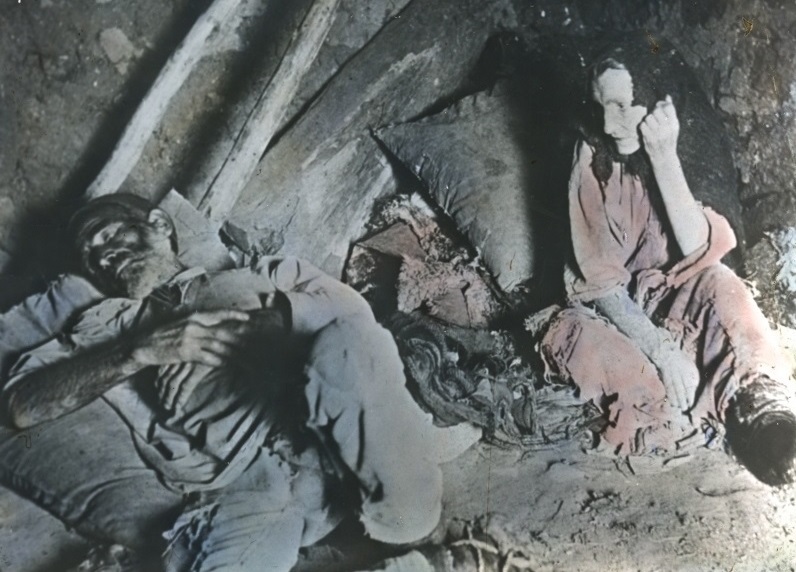 The Russian famine: tinted photographs and drawings of famine victims, mostly children. Labour policy and the famine, 1919. Labour Party pamphlet on famine conditions in Central Europe following the end of the First World War. It also includes some references to conditions in Russia. Report (political and economic) of the Committee to Collect Information on Russia, 1920. The committee was appointed by the British government and produced an extensive report on conditions in Russia, using Soviet and other sources. The report includes a section on the failure of the 1920 harvest and concerns over famine. Russia in 1921. Pamphlet by Tom Mann, describing his visit to Russia in 1921 as a British delegate to the Red International of Labour Unions. It includes a description of his visit to the famine hit area of the Volga, accompanying members of the Commission of Inquiry into the famine headed by Mikhail Kalinin. Tom Mann's photograph album, c.1921. The album includes seven photographs of famine refugees at Samara and a photo of members of Kalinin's Commission of Inquiry travelling on the Volga. A cry from Russia, September 1921. Appeal by Harry Pollitt, recently returned from Russia, on behalf of the famine fund. It was published in the journal of Pollitt's union, the United Society of Boilermakers and Iron and Steel Shipbuilders. Russian famine: Mr. Hoover's sinister role in Hungary, September 1921. Leaflet produced by the National "Hands Off Russia" Committee. Herbert Hoover (a future President of the USA) was head of the American Relief Administration, which provided aid to areas of Central and Eastern Europe after the First World War. The Committee accused him of having overthrown the Communist administration in Hungary in 1919, and plotting to do the same in Russia. Trade with Russia: the facts: to the Labour movement of Great Britain, 1921. National "Hands Off Russia" Committee pamphlet, containing answers to a series of questions by Leonid Krasin, People's Commissar of Foreign Trade. The famine is mentioned in replies to questions on foreign military intervention and the poor condition of the transport system ("Is it true... that the Russian transport system is hopelessly inadequate for dealing with famine problems, still less those of foreign trade?"). Report on economic conditions in Russia, with special reference to the famine of 1921-1922 and the state of agriculture. Extensive League of Nations report, including statistical data and maps. Appendices to the report include Mr. Hoover's Report to President Harding on the work of the American Relief Administration in Russia, the report of the International Russian Relief Committee on Famine Relief Work in Russia, and the Report of M. Ivanov, President of the Ukrainian Red Cross, on Famine Relief in the Ukraine. Transcaucasia (South Caucasus): an enquiry into famine conditions undertaken during December 1921-January 1922. Typescript copy of a report submitted to Dr Nansen, High Commissioner for Relief in Russia, by representatives of aid organisations (including the Save the Children Fund) who had visited the region. It focuses on conditions in Transcaucasia (roughly the area covered by Georgia, Armenia and Azerbaijan), rather than the better known Volga famine district, and includes a section on the causes of the famine. The Russian Famine: an appeal to British workers, March 1922. Appeal by Ethel Carnie Holdsworth on behalf of the aid efforts of Dr Nansen, published in the Railway Review, newspaper of the National Union of Railwaymen. Nansen on Russia: the most appalling famine in recorded history, April 1922. Appeal published in the monthly journal of the Amalgamated Society of Woodworkers on behalf of the Russian Famine Parliamentary Committee. It includes an extensive report of a fundraising meeting held by Dr Nansen in Manchester, reported by the Manchester Guardian. Ought we to do it?, May 1922. Article from Our Own Gazette, magazine of the Young Women's Christian Association. It includes a debate over the morality of contributing funds to Dr Nansen's famine appeal, in the form of a fictional discussion between three people. It concludes that "from every motive, humanitarian or otherwise, the relief of Russia is incumbent on us all, nationally and as individuals... Bolshies or no Bolshies!". The crushing of the Russian Revolution, 1922. Pamphlet by the anarchist Emma Goldman. It includes criticism of the policy of 'Razvyorstka' - forceable food collection from the peasants - and its effects on the famine. Russia's Economic Future, 1923. Pamphlet by the Soviet diplomat Christian Rakovsky. It includes a section on "Agricultural Progress since 1921 (Famine Year)". A 1922 interview with Rakovsky is also available, in which he talks about "how Russia was ruined" (including effects of war and economic blockade on agriculture) and "what the Soviets have done". Report of the English and French Delegation of the Workers' International Relief on the economic enterprises of the WIR in Soviet Russia, 1925. The typescript report includes references to WIR's work during the famine. The Workers' International Relief - what is it?, [1925?]. Illustrated circular which promotes the work of WIR, including the provision of famine relief to Russia in 1921. Your Poll Card with the Compliments of William Preston, 1925. Conservative and Unionist Party card produced for the Walsall by-election of 1925. It cites the famine in the Soviet Union as a reason to not vote Labour ("The reason why the loaf is so dear is the ruin of Russia by the Socialists... DO NOT RUN ANY RISKS").